Add festive winter holiday table decorations to your dining scheme to set the mood for the season. Dining around the holiday table is a tradition during the holiday season and can be much more than sitting down and eating a meal. A nicely decorated table can bring people together to enjoy the festivities and can transport your guests to your own winter wonderland. Decorations can be something as simple as a single centerpiece to something more elaborate such as a complete place setting done in a Christmas theme. Be creative and use whatever decorations appeal to you! A simple white place setting takes on an elegant look by adding a few pops of color and sparkle around the table. Keep the table looking clean and simple by sticking to solid color napkins and plates. Let the decorations speak for themselves. Make a toast to the holidays by using festive wine glasses as part of your holiday table decorations. Glasses come in a range of shapes and colors that are sure to match any holiday theme. A lovely centerpiece can be the perfect accent to your table. A simple bowl can be filled with anything from Christmas ornaments to fresh fruit. Choose bright bold colors to really make the centerpiece pop and be the star of your dining table. 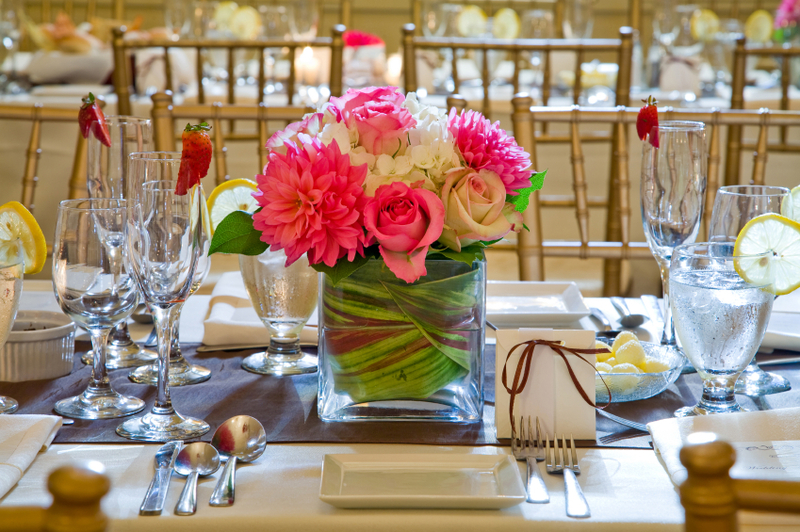 Adding a special touch such as a flower arrangement to your table can make a big difference. There are endless possibilities from elaborate floral bouquets to simple arrangements consisting of evergreens and whatever may be in season. People of all ages can appreciate a beautifully decorated table. Adding bright colors and interesting touches can liven up the table and bring a smile to everyone's face. Edible decorations such as cookies and candy are perfect to use at the table. Be sure to include decorations that will appeal to both kids and kids at heart! Winter holiday decorations can not only liven up a holiday table but can be used as a favor for your guests to take home. Items such as picture frames can serve as a place card and double as a small gift. To make it even more special, include a gift card along with it. You can make any celebration memorable by being creative with the decorations! Find even more creative suggestions for your winter party with ideas for decorative party table centerpieces.